Asiloid flies are known to science from some 8,100 species today and form a diverse clade within Diptera - true flies. The family taxa Apioceridae (“flower-loving flies”), Asilidae (“assassin flies” or “robber flies”), and Mydidae (“mydas flies”) belong to this clade while the other Diptera: Asiloidea family taxa are grouped in the therevoid clade (Apsilocephalidae, Evocoidae, Scenopinidae, and Therevidae). Asiloid flies range in size from 5–60 mm in body length and the Neotropical species Gauromydas heros (Perty, 1833) (Mydidae: Mydinae) is believed to be the largest known Diptera. Apioceridae only occur in Argentina, Australia, Chile, western North America (Canada, Mexico, and the USA), and South Africa, Asilidae are distributed world-wide, and Mydidae are more or less distributed world-wide although a number of subfamily taxa are restricted to the Southern Hemisphere. 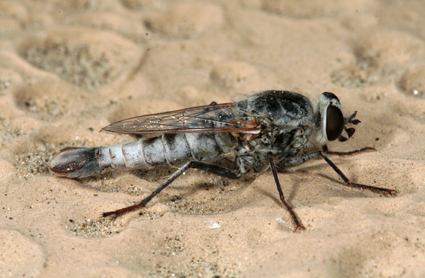 In general, asiloid flies are most diverse in arid to semi-arid environments although many Asilidae and some Mydidae species are known from tropical rain forests. While Apioceridae and Mydidae are seldom collected and are rare in insect collections due to the very short annual activity period and the very limited geographical range of species, Asilidae are encountered regularly in the field and collected by specialists and non-specialists alike. Representatives of all three taxa have been flying since the diversification of angiosperms: Asilidae and Mydidae are both known from the Crato Formation of north-eastern Brazil (approximately 112 Million years ago) and putative Apioceridae are known from Baissa, Russia (approximately 132 Million years ago) and Bon-Tsagaan, Mongolia (approximately 121 Million years ago). The extinct Protapioceridae from the Upper Yixian Formation of China (approximately 145–150 Million years ago) is probably closely related to Apioceridae and Mydidae. This web-site provides information on the research on asiloid flies conducted by Torsten Dikow and his laboratory at the National Museum of Natural History of the Smithsonian Institution. Research cited on this website is currently or has been supported in the past by the National Museum of Natural History of the Smithsonian Institution, the American Museum of Natural History, Cornell University, and the Field Museum of Natural History. The U.S. National Science Foundation has provided funding for two projects: a REVSYS grant on Apioceridae, Asilidae, and Mydidae (DEB 0919333, 1 Aug. 2009–31 Jul. 2013) and a DDIG on Asilidae (DEB-0608258, 1 Jun. 2006–31 Aug. 2007). Any opinions, findings, and conclusions or recommendations expressed on this web-site are those of the author and do not necessarily reflect the views of the National Science Foundation. Partial funding was also provided by the John D. and Catherine T. MacArthur Foundation funding of the Biodiversity Synthesis Group of the Encyclopedia of Life. Fly images in logo by Jean & Fred Hort.